A North American mammal, Antilocapra americana, that resembles an antelope. If historical records are accurate, the current population of about 250 pronghorn in the northern range is less than 15% of that in the early 1900s (YNP 1997) (Figure 4–7). When a pronghorn breaks into an easy, rocking canter (a 30 miles per hour pace that it can keep up indefinitely), the humerus swings back and forth over just a few inches with each stride. Only when a pronghorn stretches into a gallop does the humerus appear to be swinging freely, and then the hoof travels several yards with each stride. For the 10-year period 1981-90 an additional 736 pronghorns were transplanted within the state. 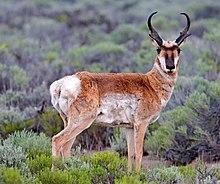 During 1980-90, pronghorn occupied about 13.5 million acres in the Trans-Pecos, High Plains, Rolling Plains, and Edwards Plateau ecological regions. Antilopcapra americana on Wikimedia Commons.